Liza O'Brien certainly did not suspect that drawing pictures of cats would lead her to finding a murder victim and putting her own life in danger. She had simply started out to draw pictures of cats for a book which she was preparing. She had visited the home of Pam and Jerry North to draw pictures of their cats - Gin, Martini, and Sherry. Jerry North was Liza's publisher, and he and Pam were noted for their crime solving abilities. Then Liza moved on to draw more cats at a little pet shop on West Kepp street. When she got there the shop was open, and she went in to admire the animals. It seemed that the owner, Mr. J. K. Halder, wasn't around. A very little man came in, and Liza and the little man looked around the shop and found the dead body of J.K. Halder in an animal cage. The little man looked so upset that Liza dashed into the room where Halder lived and got a drink for the little man. When she returned to the shop, the little man had gone, and she was alone in the shop with the dead body. Instead of calling the police, she called her boy friend, Brien Halder, the dead man's son. This was how it all started. It would all become much more complex. It would turn out that J.K. Halder was a bit more than a simple pet shop owner. Liza met the members of the Halder family who were fighting among themselves. 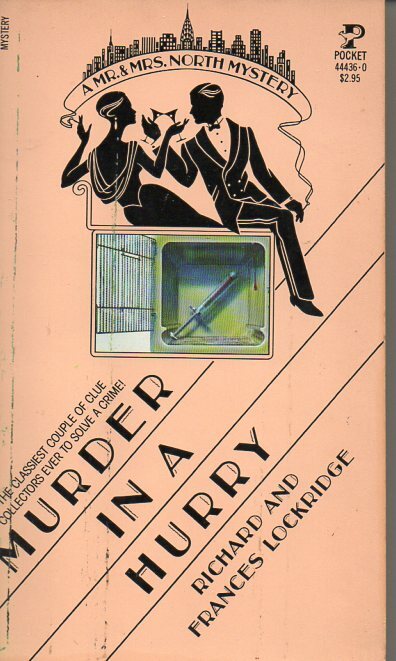 Another murder would occur, and Liza began to wonder if she wouldn't be the next victim because she might know something about the murderer. She even began to suspect that Brien Halder wanted to murder her. Pam and Jerry North came to her assistance along with Bill Weigand of the New York police force. All would be solved, but the reader should be warned that the really important clue comes quite near the end of the book. I always enjoy the Pam and Jerry North books. The Norths enjoy a good life in New York, make witty comments, and seem to drink a good bit of alcohol while solving crimes. These books are very pleasant cozies, and may be read for enjoyment rather than for the intricacies of the plot. This book was published in 1950. I have read it for the 2018 Just the Facts, Ma'am challenge. 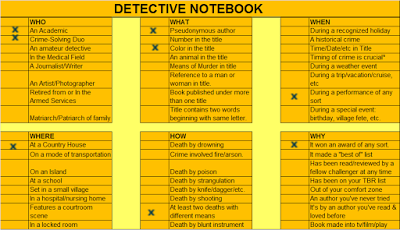 In my detective notebook, it will be entered in the category Who - A crime solving duo.